This selection is from Mary McMyne’s chapbook, Wolf Skin. neatly hung, the red ripple of fabric. The crackling fire. The light flickering in the hall. In the bedroom someone is sleeping. At the foot of the bed, two well-worn slippers. On the side table, one book. One pair of spectacles. Night fills the room like cradlesong. In the story you tell your friends, you’ll say you took home the wolf skin as a trophy. she was. But the truth is the girl spoke only three words that day: Who are you? We were dead. It was dark when you left the grandmother’s house, and cold. under your feet like fire. This selection is from Mary McMyne’s chapbook, Wolf Skin, available from dancing girl press! Purchase your copy here! Mary McMyne is the author of Wolf Skin, a chapbook (dancing girl press, 2014). She grew up in south Louisiana, studying English and creative writing at Louisiana State University before moving to the east coast to study fiction. Since earning her MFA from New York University, her poems and stories have appeared in Word Riot, Pedestal Magazine, Painted Bride Quarterly, Los Angeles Review, New Delta Review, and many other publications. Her criticism has appeared in American Book Review. Her poetry has been nominated for the Pushcart Prize and the Rhysling Award, and her fiction has won the Faulkner Prize for a Novel-in-Progress and a Sustainable Arts Foundation Promise Award. Since 2011, she has lived in Sault Sainte Marie, Michigan, where she is co-editor of the journal Border Crossing and an assistant professor at Lake Superior State University. Learn more at marymcmyne.com. 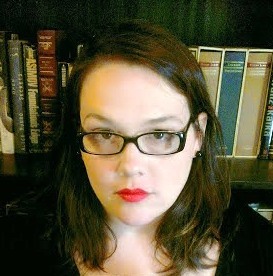 Meagan Cass is an Assistant Professor of English at the University of Illinois Springfield, where she teaches courses in creative writing, independent publishing, and composition, curates the Shelterbelt reading series, and advises the campus literary journal, the Alchemist Review. Her fiction has appeared in Hayden’s Ferry Review, The Pinch, Hobart Web, PANK, and Puerto del Sol, among other journals. Magic Helicopter Press will publish her first fiction chapbook, Range of Motion, in January 2014. She holds a Ph.D. in English from the University of Louisiana Lafayette and an MFA in fiction from Sarah Lawrence College.